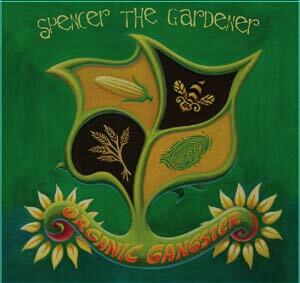 SUSTAINABILITY ROCKS: With his latest full-length, Organic Gangster, Santa Barbara staple Spencer the Gardener has officially championed the cross-over into “family-friendly” artist-and I, for one, could not be happier. A relative fixture during S.B.’s high holidays (read: Fiesta and Solstice), Spencer and his band of musical merrymakers have had kids’ heads boppin’ and hips shakin’ for years. But Gangster provides that extra dose of educational goodness that makes it worthy of its “family record” title. The songs, like lead track “Genetically Modified Food,” allow the band to embrace their ever-quirky songwriting style, while still doling out a message about the importance of eating organically. Add to that the fact that Gangster provides a home for the ever-popular-though never released-Thanksgiving favorite, “The Gobble Song,” and you’ve got an album that’s ripe (all puns intended) for holiday gift-giving. Bandmates Spencer Barnitz, Vaughn Montgomery, and Chris Holmes will be playing in support of Organic Gangster throughout the month, with shows lined up all across the county. On Wednesday, November 25, the guys play Papa Lennon’s (515 W. El Roblar Ave.) in Ojai at 6 p.m. On Saturday, November 28, they hit up Santa Ynez High School (2975 E. Highway 246) at 10 a.m. And later that night, the band returns home for a show at Carr Winery (414 N. Salsipuedes St.) at 8 p.m. For more on the band, or to order a copy of the album, visit spencerthegardener.com. BITE ME: Also on the post-Turkey Day agenda this weekend are the bizarrely enticing Little Teeth, who will play the Biko Co-Op Garage (6612 Sueno Rd.) in Isla Vista on November 28. This San Fran trio is taking the idea of experimental folk to a whole new level thanks to layers of childlike lilting vocals and a whole slew of old-timey instrumentation. (Think glockenspiel, Autoharp, tin drums, dulcimer, and banjo, for starters.) The tunes fluctuate between almost orchestral dirges and slow building vocal onslaughts, calling to mind everyone from Ariel Pink’s Haunted Graffiti to Flaming Lips. The show starts at 9 p.m. Visit myspace.com/biko_garage for details. DIG THIS: This Wednesday, December 2, SOhO (1221 State St.) plays host to an extra-special night of underground hip-hop from two-thirds of the Grammy Award-winning group Digable Planets. Together, Planets’s Ishmeal “Butterfly” Butler and Craig “Doodlebug” Irving continue on in the same musical vein of their onetime three-piece, crafting smart, eloquent, and community minded rhymes against a backdrop of samples that move between straightforward beats and electro-tinged jazz tracks. 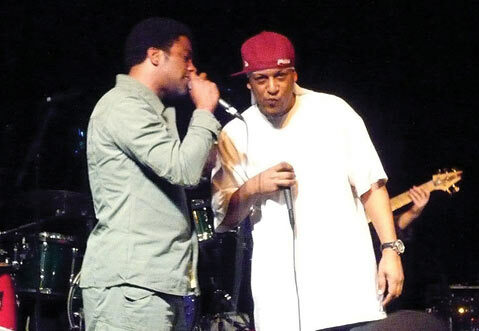 Long known for their ability to weave jazz treatments and sounds with raps and hip-hop rhythms, Digable Planets paved the way for modern-day alternative rhymers like Lupe Fiasco, Aesop Rock, and Outkast. Today, Butterfly and Doodlebug are touting their own solo projects, but that certainly doesn’t mean Wednesday’s show will be light on the collaborations. Perhaps we might even get a taste of the group’s 1993 hit, “Rebirth of Slick (Cool Like Dat).” For tickets and show info, call 962-7776 or visit sohosb.com. ONE FOOT AT A TIME: And down the road a ways, San Diego neo-Christian rockers Switchfoot headline the Majestic Ventura Theater (26 S. Chestnut St.) on Saturday, November 28, at 7 p.m. Whether or not you consider yourself a fan of these humble platinum-selling alt-rockers, chances are you’ve probably heard their tunes. (Remember 2004’s ubiquitous “Dare You to Move,” anyone?) Nowadays, the five-piece, led by musical mastermind Jon Foreman, is out in support of their latest, and arguably most hard-hitting, record, Hello Hurricane. The album is the first up of an elongated recording session-which resulted in four full-length records-with famed producer Mike Elizondo (Dr. Dre, Eminem). To catch them live, call 653-0721 or visit venturatheater.net.